Marco Rubio Says His Immigration Policies Would Have Kept His Parents From Entering the U.S. Given that Marco Rubio’s best hope is that the polls are very, very wrong, the once-favored candidate seems to be death-spiraling toward obscurity. Last night on MSNBC, John McCain’s 2008 campaign manager called Marco Rubio’s path to the Republican nomination “a fantastical, alternate reality version of the universe,” and last week’s series of Donald Trump digs (including an uninspired line about the size of Trump’s hands) did little to help his numbers. So during tonight’s MSNBC forum, Rubio appeared to take a different tact: brutal honesty. He was so honest, in fact, that he admitted his own parents wouldn’t have been able to enter the United States under his proposed immigration policy. When asked by an audience member whether his immigration policy would shut out people like his parents, who immigrated from Cuba, Rubio replied it “wouldn’t shut them out, but it’s a different process.” He went on, “When my parents arrived in the U.S. in 1956, my dad had a fourth-grade education. My mom had about the same. If they came today under those circumstances, they would really struggle to succeed” because they wouldn’t have the necessary skills to be competitive in today’s job market. He went on to say that modern immigration policy “has to be primarily based on merit” and that immigrants “should be able to prove what skills [they’ll] bring to the U.S.” In other words, if they tried to enter the country today, Rubio’s parents probably wouldn’t have made the cut. A merit-based system, such as the one Rubio is proposing, has faced criticism for overemphasizing formal education and employment while overlooking unpaid work women perform in the domestic sphere. It also places relatively little value on family ties, and the American Immigration Council suggests it would carry implicit age and gender biases. 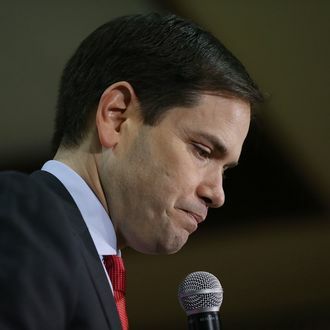 Rubio Plan Would’ve Barred His Parents From U.S.